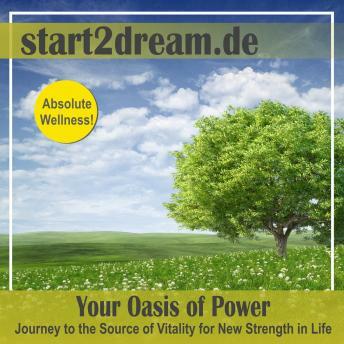 Guided Meditation "Oasis of Power"
In deep relaxation you are able to charge your power ressources for everyday life: The guided imagery "Your Oasis of Power" combines deep relaxation, positive suggestions and powerful inner pictures to give you a feeling of intense vitality - a connection with your inner power source. The combination of proven relaxation techniques and visualization facilitates intensive regeneration and stress relief and helps you to stay calm and relaxed in everyday life. In "Your Oasis of Power" you will discover the tree of life during a walk through a beautiful natural landscape. This tree symbolizes a protective, refreshing power that connects and preserves all living things. A superior listening experience, recorded in professional studio quality.